RTF Shares Thanks: Adventures with Rhode Island Robots! The Sphero Sprk+ and iPad will introduce my classroom full of curious and intelligent students to the benefits of coding/programing. The Sphero will allow my students to see physical responses to digital inputs. An experience like this is physically tangible compared to what many digital sites currently offer. With the Sphero Sprk+ rolling across our floors, students in my classroom will engage in STEM lessons that will give them an early introduction to a growing field. Students will encounter problems in their codes that will need to be revisited and problem solved. They will have to work together as part of a team to conquer and overcome a plethora of situations. 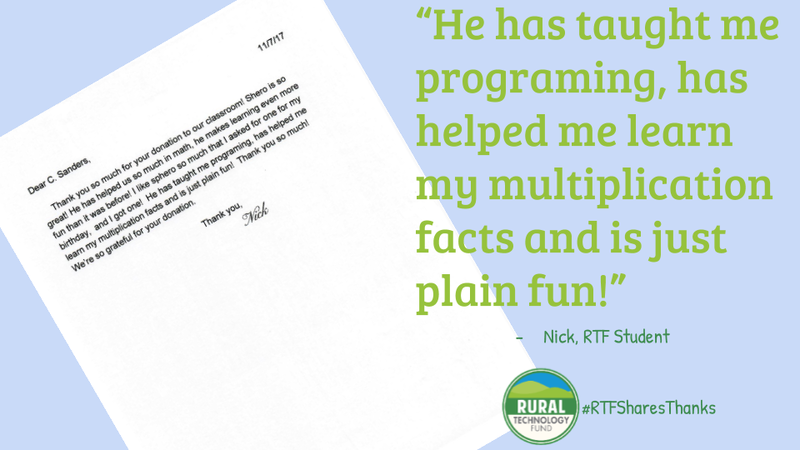 Not only will they learn about coding, but they’ll have fun, and keep coming back for more! Mr. C’s 42 elementary school students are full of creativity and as he put it “a generation of video gamers, youtubers, and social media experts.” What better way to foster their learning spirit for science, technology, engineering and mathematics than via immersive technological experiences. Sphero bridges the digital and physical worlds so that students see their work immediately in action. Just see how the classroom combines coding, the Sphero robot and a map on a rug to learn! Not only has Sphero been an exciting component in problem solving, it has provided numerous opportunities to explore mathematical concepts. My students worked with sphero to create rectangles. While programing it, they had to apply their knowledge of rectangles to create blocks of code that would represent the different sides. Once they ran their program, then marked the corners and then used measuring tape to determine the perimeter of the rectangle. I’ve never seen a group of fourth graders so excited to explore perimeter. Sphero allowed my students to actually get hands on with a concept that is often very confusing. To differentiate the experience with Sphero, I had some groups explore creating functions and using loops to repeat the length and width of the rectangle. This allowed them to make more efficient programs. I was shocked and proud to see how excited students were to explore a concept as new as functions and loops! They did so well working together! Overall, the thrill that sphero has brought to our classroom is beyond valuable. Students love to “play” with it, all the while learning, exploring and problem solving. Many students, excited over their time using sphero have claimed that they are going to ask for one for Christmas. Others have already received one for a birthday present. 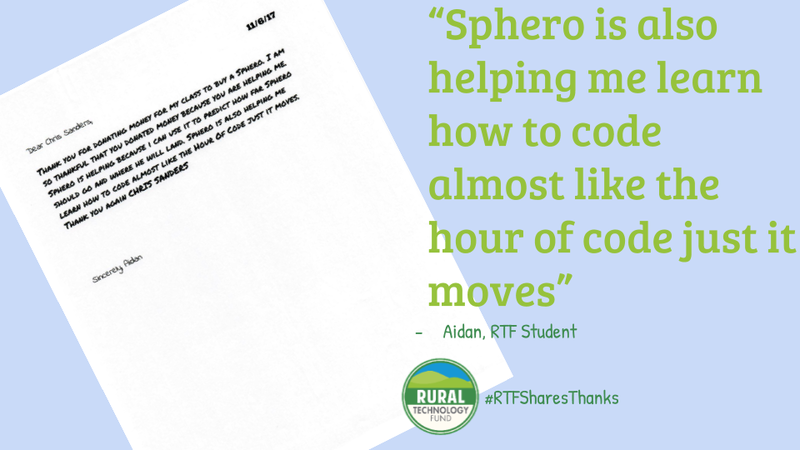 Without your donations, these students would not have heard about sphero, nor explored the power of programing one. More importantly, my students who are unable to receive one as a gift due to finances, have the same opportunities as my more fortunate students. Those opportunities, those experiences, the thrills along with the discoveries are all due to your generosity. 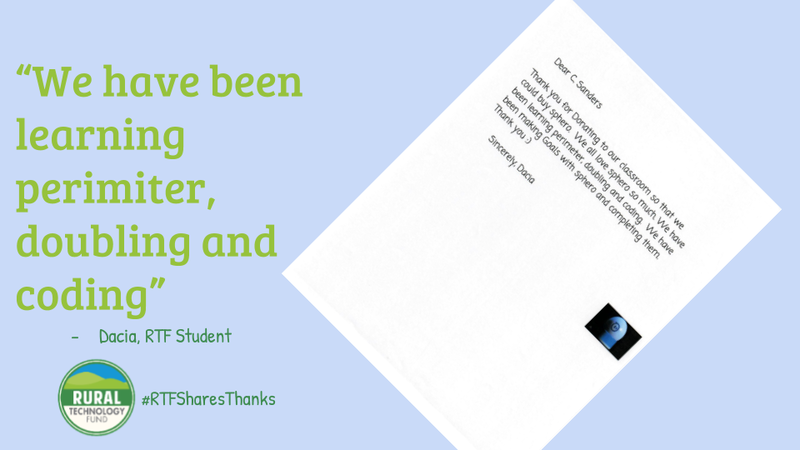 Thank you again from bringing Sphero and all the experiences that come along with it, to our classroom. The Sphero SPRK inspires innovation, curiosity and ingenuity by pairing an educational app and hands-on technology. Students are collaborating together to solve problems ranging from mathematical equations, programming solutions and real world interactions. This helps prepare them for bright futures as technologies, mathematicians, entrepreneurs, software developers and engineers. Our favorite part is of course hearing about all of the fun and learning from the amazing students themselves! Chloe Moving Sphero in a Rectangle! 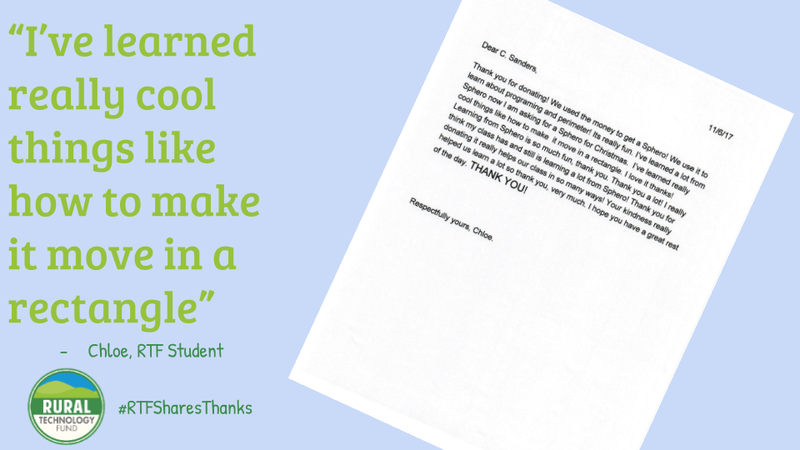 We’re thrilled to have made an impact on the community of Wyoming, RI and its students! 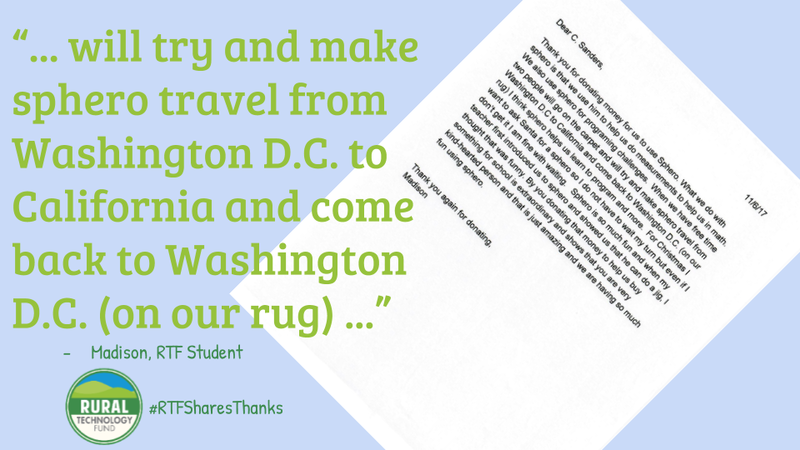 Check out our blog, twitter and facebook pages for other editions of #RTFSharesThanks! Rural Technology FundNewsRTF Shares Thanks: Adventures with Rhode Island Robots!